Salomon Brigade Helmet with Built-In Audio Black. Salomon makes great fitting, protective helmets. This includes injected abs + eps liner for durability. Salomon Brigade Helmet with Built-In Audio Black. Salomon makes some great fitting, protective helmets. Now this also has built in Audio to plug right into your MP3 or Smart phone. Helmet includes injected abs + eps liner for durability. 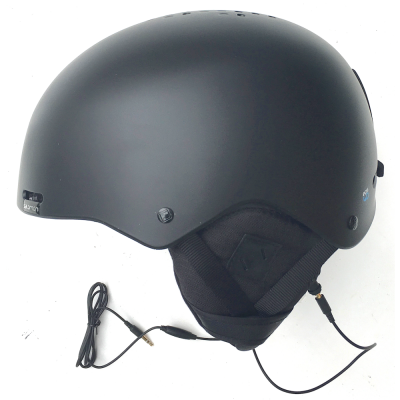 Brigade Audio helmet has built in wired audio system for premium sound quality with no battery charging. 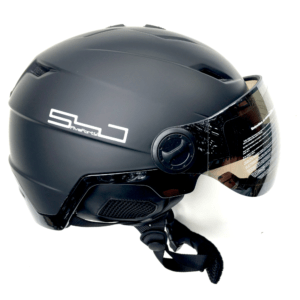 Salomon Brigade Helmet with Built-In Audio Black is the perfect partner for park & pipe lovers, with a wired audio system, trendy style and now featuring Salomon’s Custom Dial adjustment system for an even greater fit. Airflow system offers optimal climate control. This features a round fit as well. You can answer calls (while you’re flying down the mountain) or cruise with music from your MP3 player, or stay in touch with your family or friends without having to hold your phone or take your helmet off. Please make sure to measure your head around your forehead and back of your head to make sure on which size is best.